When it Rains, It Pours... So move bees! The weather has been certainly ever changing this Fall and all of us have had to adapt, including the Bees. Yesterday it was beautiful out and 60 degrees and now the rest of the week has been colder with lots of rain. 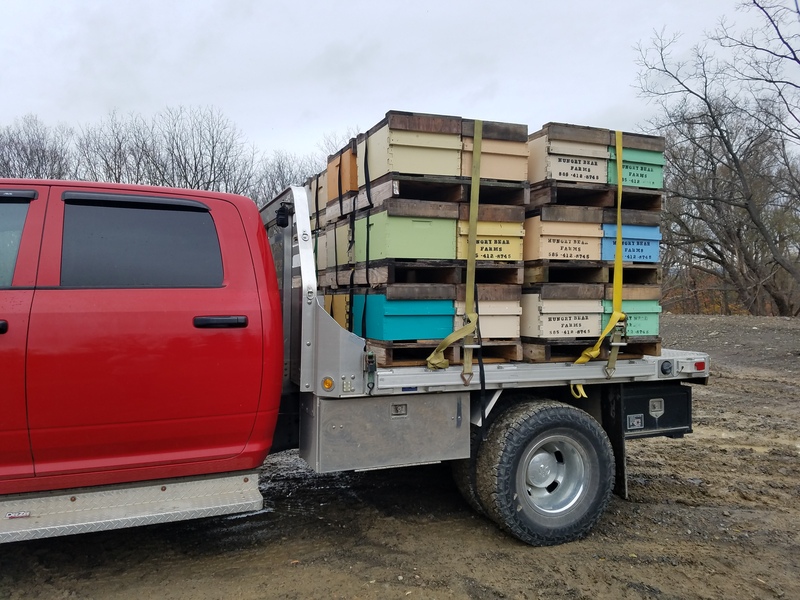 Beekeepers usually find themselves in a quandary on rainy days as bee work outside can't usually be done, unless of course you need to move bees. This was on my to-do list two days ago as we had some hives in a location that is going to get bulldozed. So, rainy day, no worries. Let's get moving! So as with any growing operation, you acquire the tools you need as time goes on, not right away. We have a tractor with forks to use to move bees as we're still looking for the right forklift that will do the job. So in the meantime, Blue Bessie, our New Holland Tractor works just fine. One of my helpers was trying to load the 4-way pallets of bees with the tractor forks but if anyone knows hydro-static tractors, they know that if you turn left the forks have a tendency to go right and so on. So you have to judge your movements carefully and line up into position correctly. My helper was having a tedious time trying to line everything up so I took over the bee moving. With it cold and misting out, the bees weren't flying except the brave few who were going to die to protect the colony, literally. I took a sting under the eye as I wasn't wearing a veil, my own fault, but I survived. Beekeeper 0, Hives 1. After about a half hr of sloshing around in the mud and rain on the tractor loading bees, we were all set. Got everyone ratcheted down and set for the move. The girls were watching me from the entrances very inquisitively as I tied the knots, almost as if to say, one more inch closer and we're sending out the infantry. A hive or two were brave enough to come out into the weather, even just a few feet from the entrance, pouring out of the hive then retreating quickly from the rain. Beekeeper 1, Hives 1. I got the girls all moved to their new location, nestled into the perfect little hedgerow. They'll be out and flying about on the next warm day and will be out of the way of the work we need to get done. With moving bees on the rainy day done, it was time to curl up on the couch and get warm! very light. And those that are feeding have been going thru quarts and quarts of syrup as the bees hungrily take the syrup down. We feed 2:1 Sucrose Syrup which is the same sweetener used in soft drinks and teas. Perfectly safe for the bees as it's pure cane sugar, just in liquid form. We use frame feeders in all our hives that are migratory. 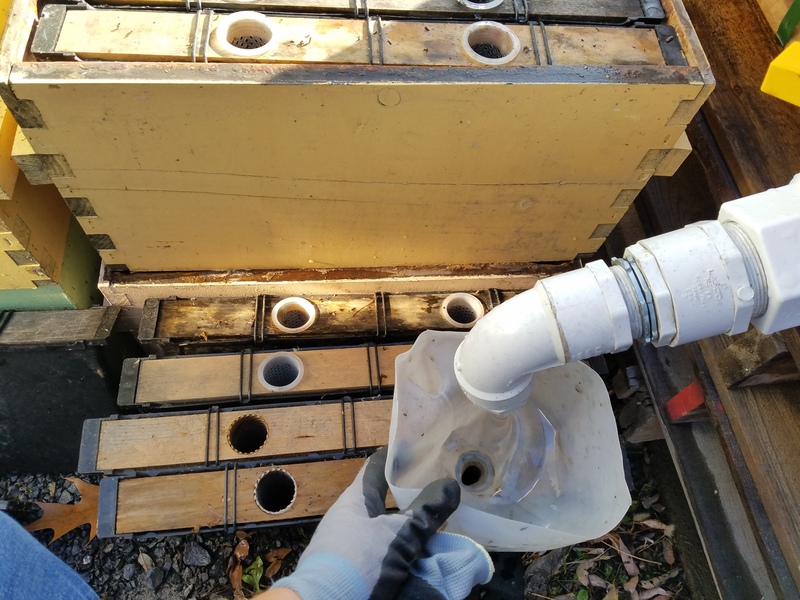 They hold a gallon of syrup and they have plastic ladders that the bees can walk on to avoid drowning, which are also easily removable. Since we usually get syrup in in totes, I've got the tote set up on a pallet with a spigot on it for easy filling. Easy filling tip #1, cut a gallon milk carton in half and use it as a funnel to fill up the feeders. Fits perfectly in the hole, doesn't spill and you can hang on to the handle to steady it. And yes I came up with that all by myself. Necessity is the mother of invention. So after about 45 mins of filling I had over 50 feeders ready to go. Got them all loaded up on my truck and was off to the yard that had all the singles I moved the day before. The mission today was get everyone fed and make sure any remaining nucs were put into deep boxes and fed as well. Upon inspection the hives were definitely needing to be fed, even tho they still had honey, they were eating thru their stores faster with this warmer weather. If I had not checked them and just assumed they would be fine and left it to chance, they would probably not make it thru the winter in NY or even in Florida. So it's my hope that anyone reading this or thinking about their bees in the nice weather will go check them in case. It doesn't hurt to err on the side of caution and make sure your girls have plenty of sweet things to eat! I was going thru the yard in my normal fashion, talking to the girls. I'm positive they understand what I'm saying. Most of the time you have all the obedient good little girls going about their jobs foraging and cleaning and then you run into those few who are acting like rebellious teenagers, buzzing angrily around you and then flying off in a tantrum. It was a beautiful day and the bees were enjoying it and making the most of it like I was. I was busy hiving nucs and installing feeders while the girls were out foraging most likely for any pollen left around and resins to make propolis. 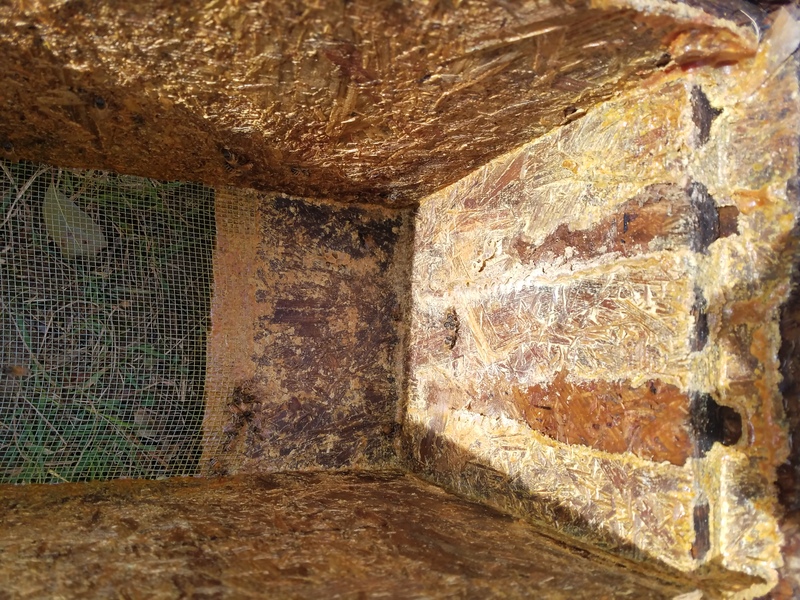 It still continues to amaze me the amounts of propolis they use to seal up the hives and even coat the walls of the boxes they're living in. It was like they opened a gallon of propolis and just painted all the walls in their hive. The queen probably woke up one morning and said, "I think we need a change, let's paint the walls a nice goldenrod yellow with amber accents." And so when you find that hive you know they are prepared for winter and their redecorating is done. They've got all the cracks sealed up and all their insulating done. They're on the ball and the queen's happy. While moving things around I found another surprise, things us beekeepers like to say 'oops' to and let the bees work it out. In this circumstance I had moved a nuc box that the bees had swarmed into and I thought they had frames in the box so didn't mess with them for a while. You get busy in the end of the summer and some things just aren't at the top of the list like they should be. So it was with this nuc. 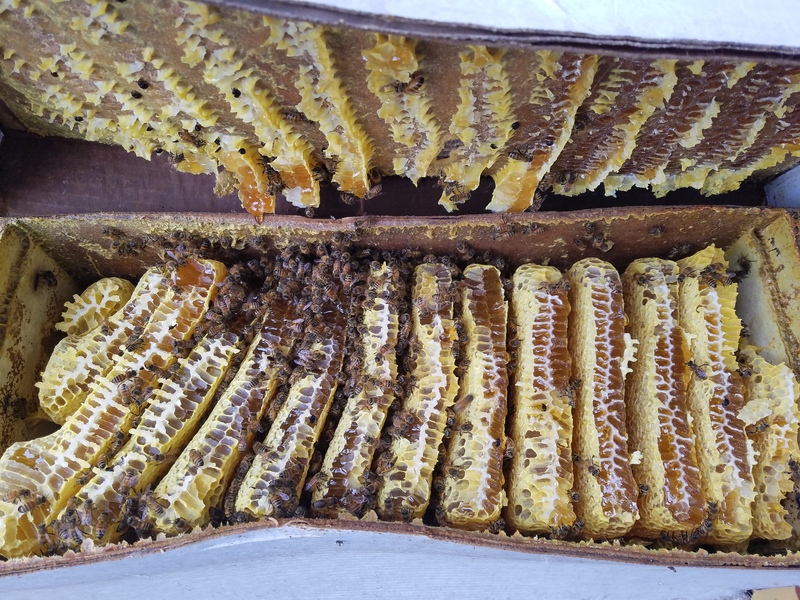 A swarm that decided to take up residence in a cardboard nuc box that was stacked in a pile, #5 high and leaning slightly to the left. So it got moved with the rest of the nucs that I moved to another yard for installation and when I opened it up, to my surprise there were no frames but they looked healthy and completely full of honey. So this nuc will be wrapped and insulated and monitored thru the winter as it would be foolish to take them out of where they are now and risk ruining the comb and killing the bees. It was exciting to see all the beautiful comb they had made in the box and how everything looks just so. And so the hours went by, nucs were installed and hives were fed. Left the yard feeling accomplished and ready to relax. It's these nice fall days that we have that we appreciate the solitude in the bee yard no matter how much we hurt and ache from the work. We still appreciate the quiet hum of the apiary, all the ladies working tirelessly together in perfect harmony with one goal in mind, survival. It's in these moments that you find solace in the place you are in the world and contentment with the beauty around you. These are the moments that keep a beekeeper going.